Online flight search is booming, with a few heavy-hitters who consistently turn up good deals on flights and sometimes hotels. These aggregators trawl hundreds of airlines and web-based travel agents to turn up thousands of results for even more thousands of flight combinations. The problem is sifting through it all and ensuring you really are getting the cheapest deals – including being clued in on whether that bargain price is going to end up dipping next week. Buyer beware: Most fares found by these flight search engines don't include the baggage fees charged by some low-cost airlines as well as United and Delta. In some cases, they don’t include fuel taxes and other surcharges; and in others, the fare advertised may have mysteriously disappeared by the time you click through to the provider. We picked six of the top-rated flight aggregator services and compared prices for 8 flights over a week in June, from domestic flights including New York to Los Angeles, Seattle and Las Vegas, and international flights from New York to Toronto, Sydney, Paris, Rio de Janeiro and Hong Kong. We also looked at how easy the services made it for users to compare costs, flight times and overall suitability. 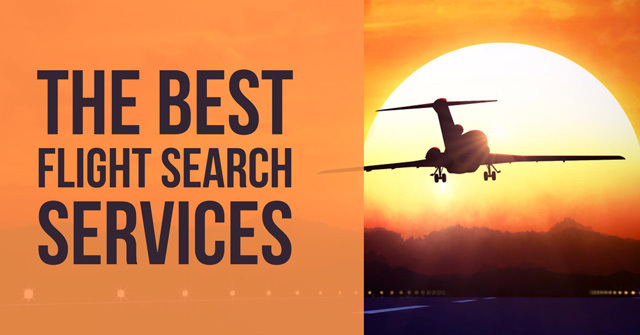 Which flight search service is best for you? Available for Android, iOS, Windows and BlackBerry devices. 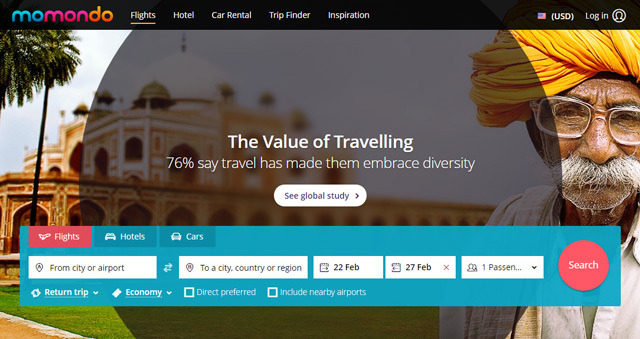 Momondo is a flight, hotel and car rental booking site that has a brilliantly intuitive controls. Flights can be ordered by price, speed or “best,” based on an algorithm computing flight duration and cost. And it produces sophisticated results – Momondo offers the most finely tuned ranking of the value of flights, making it easier than any other flight search engine to find a compromise between budget and convenience. There are extra checkboxes for filtering by airline, departure or arrival times and, uniquely, by frequent flier alliances, which is handy if you're savvy about air miles. Two bar graphs show the rise and fall in price of both outgoing and return flights. If you can't quite decide where to go on your next vacation, hit the Trip Finder to find destinations based on what you want to do (city break, shopping, the beach), when you want to do it, a rough area to head for and, most usefully, the budget you have available. 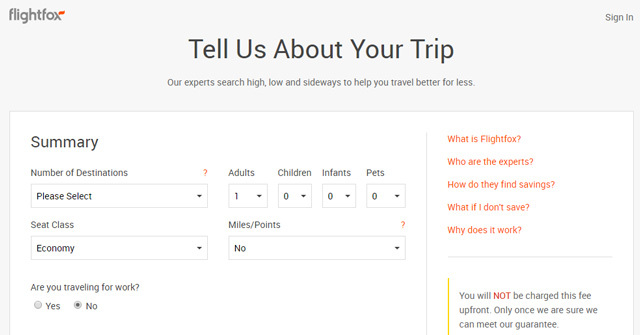 Bottom line: Momondo has excellent coverage of online travel services and airlines and, in our test, it turned up the cheapest flights (either within a handful of dollars of the cheapest, or about 2 percent to 4 percent cheaper, which can be a few hundred bucks for international flights). Choosing flights is made easy by a clever set of filters for airlines, flight times and convenience, while the bar graph fare calendar helps flexible travelers pick the cheapest dates. Available for iOS, Android, Windows and Kindle devices. 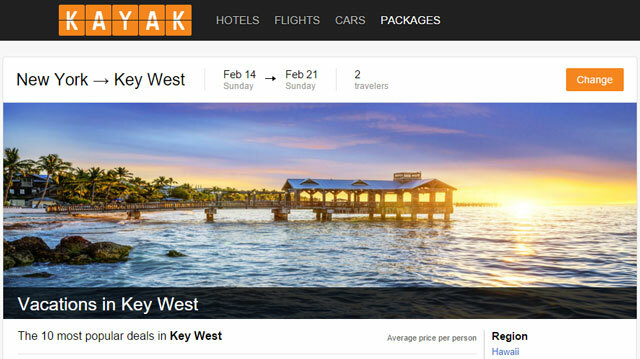 The granddaddy of flight aggregator search sites, Kayak offers a super fast search and tons of ways to filter your results, including an intuitive slider system for adjusting approximate takeoff times and options to show or hide redeye flights, view flights with Wi-Fi only and see “hacker fares,” where different legs of a journey are purchased separately. Also handy is the ability to adjust the maximum layover you're willing to bear. There’s an option to order the flight results by “recommended”, which weeds out the dead-cheap, over-long duds. A price trend graph offers advice on whether flight prices are likely to go up or down, giving you as much peace of mind as one might be able to expect, while the fee calculator can add credit card and check-in luggage fees to the posted fares. If you search for flight and hotel packages, Kayak can also tell you how much you’ll save by booking the two together over booking them separately. Bottom line: Kayak almost always found cheaper fares than any the flight services in this list (or at least within a few dollars of the cheapest), though its international fares seem to be outdone by Momondo with a 10% cheaper Sdyney fare for Sydney, and 30% on Hong Kong. Its fee calculator for credit card and luggage fees also means you're most likely to click through to a posted fare. Available for Android, iOS, Windows, Kindle and, BlackBerry devices. The third member of the Big Three established flight engines, Skyscanner offers similar results to Kayak in an equally straightforward interface. It provides a couple of easy tools for filtering out particular features like takeoff times and number of stops. Clicking on a particular flight shows exactly how long the layover is. However, there is little additional information given about flights; for example, there's no obvious indicator for overly long flights (as most of the other services in this list offer), nor does Skyscanner show in-flight amenities like Wi-Fi. Bottom line: Skyscanner tended to turn up domestic fares that were slightly more expensive Kayak's by anywhere from $5-$50 for flights that cost $400 to $500. It matched the other services for rates Sydney but missed finding the cheapest flights to Hong Kong, Paris and Rio (despite finding the same airlines). 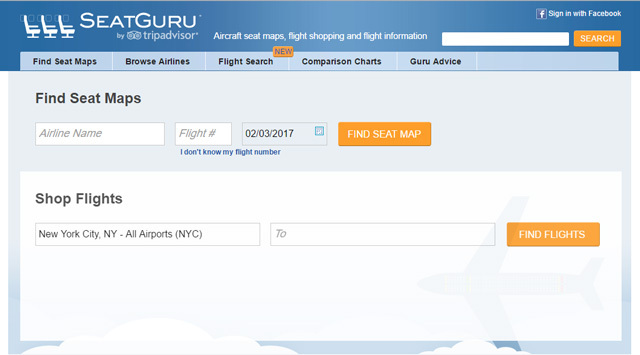 SeatGuru is an airplane seat plan and flight search site, owned by TripAdvisor, that offers many intuitive filters for your travel hunt in a simple, quick-to-use interface. Results are displayed in a clean, comprehensive style that allows you to sort based on price and direct flights, filter to “avoid early flights” and weed out pre-8 a.m. departures, and apply a “best value” selector calculated by flight time, cost and number of stops. Each result displays various flight amenities, such as Wi-Fi, the option to purchase additional legroom and whether the seat pitch is average or good. SeatGuru uses the Expedia database for hotel packages, so you'll see the odd, ad-like hotel suggestion pop up in the middle of your search results to show you how much you'd save by booking a stay along with your flight. A minor gripe is that it lacks the ability to change currency shown – that depends on the location you’re in while searching, which can make it hard to get a handle on how much a flight really costs if you’re looking in another country’s currency. Bottom line: SeatGuru came up with comparable fares for international and domestic routes though Los Angeles came in pricier by about 5-10 percent. Its filters for search results make choosing a flight easier than those on Kayak and Skyscanner, especially for business travelers for whom in-flight WiFI may be a larger factor, but its “G-Factor” rating based on inflight-amenities feels a little irrelevant when economy class flights all hover about the 6/10 mark. The home page of Hipmunk consists of a minimally designed search box asking where you want to go and when. But the real design beauty of Hipmunk comes when you get the results, which can be filtered by “agony” rating. Layovers usually push up the agony factor – but can be instantly spotted thanks to the visual results list the displays flights in bars that represent their length, including time spent in a particular airport. You can also order flights by price and takeoff or landing times. When booking flights, the outgoing and return legs are chosen separately, making it much easier to pick the times you want, rather than plowing through the endless list of flight combinations employed by many other sites. Any extra cost incurred by particular flight times is displayed next to the flight, so you can easily scroll to the choices that don't cost extra. Bottom line: Hipmunk tended to find the cheapest domestic fares (that is, as cheap or cheaper than the other services in this list), but came up about 10 percent higher for Paris and didn’t find the same scope of flights for Rio de Janeiro as, say, Momondo and Kayak. Its visual interface is a nice twist on the standard list view, but the results were somewhat slower to load. 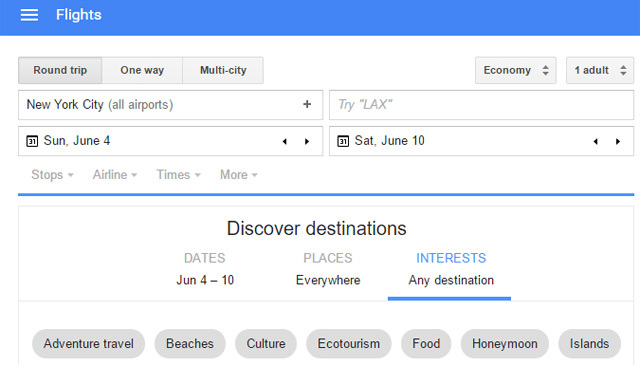 With the world's most-used search engine backing it, you'd expect Google Flights to clock a blistering search time, and it does. The interface is reassuringly clean, minimal and Google-y, returning results in about a second — much faster than every other service. At the top of each results list is a tip suggesting how you can fly for less; for example, we could have saved $85 on our $368 New York-Vegas flight by returning a day earlier. This change is bookable by simply clicking on the tip. Otherwise, found flights are filtered with “best” flights first, based on flight times and flight duration balanced against cost; it doesn't always choose the direct or cheapest routes. Flights can be booked as separate legs with different companies. You can save your itinerary for price alerts on Google Now or share it via email with your travel buddies. Bottom line: Google Flights scored similar or slightly cheaper fares for domestic flights and the longer flights (NY-Sydney/Rio), but it turned up substantially (around 30%) pricier flights for Paris and Hong Kong. For straightforward flights — fly there, come back — most of us can quite easily get the best deals simply by hitting up one flight aggregator site or, in many cases, an airline that flies where we want to go. But when it comes complex routes like a transcontinental trip in January from New York to Sydney with stops in Singapore and Bangkok, you're unlikely to get the best price (or airline selection) by simply punching in a multi-city trip and booking it all through an aggregator site. For example, the low-cost airline Scoot that flies direct from Sydney to Singapore didn't turn up as an option on this route (despite being listed on at least some of the other search engines). This type of itinerary is where new-gen travel services such as Flightfox make their coin. Unlike traditional travel agents, Flightfox does not take a commission on flight sales. Instead, the company charges customers a flat fee for a human agent to hunt down the best fare for a given itinerary and then send the customer the link to book themselves. Van der Rohe says he mostly uses the same sites as we might, as well as a few accounts that send extra information about fare availabilities. “What we have is a knowledge of routes, fare rules and loopholes that can lower the cost of itineraries beyond what you might see at first in flight search engines,” he says. (He won't divulge what these loopholes are, exactly.) He did, however, share a few tips for searching with flight aggregator apps at home. “There's a lot to be said for brute force,” he says. Search as many flight combinations, airlines and routes as you can think of across many different sites. If a flight aggregator site isn't giving you the price you want, look up an airport's Wikipedia page and see which airlines fly to it. Then search for fares on these airlines' pages. Follow the Secret Flying blog or its Facebook group – this fantastic site posts at least a few times a day about cheap flights due to airline promos or error fares, with links to book them at the many of the same sites we’ve covered here. Comb forums such as FlyerTalk and MilePoint, which are bases for travelers to share flights and routes and deals. If you're very eager (or a travel manager),subscribe to Expert Flyer, a site aimed at frequent flyers that sends alerts when a particular seat on a flight becomes available. “Sometimes seats right next to each other are different fares,” says van der Rohe. As for when to book to score those cheapest fares, Kayak research based on a year's worth of search data found optimal days to leave and return and an optimal window during which to make your booking. For example, you're likely to find the best airfares to Europe from the United States and Canada by departing on a Wednesday and returning on a Tuesday and booking six months in advance. In contrast, an Asia trip is best booked five weeks in advance, departing and returning on Wednesdays. At the end of the day, finding the cheapest airfare is best accomplished by grunt work interspersed with anxiety over whether flights are going to get any cheaper. That's why van der Rohe advises customers that if they see a price they're happy with, they may as well just book it. What do you think? Do you put effort into getting the cheapest airfares, or do you save time by simply booking the first fare you're happy with? Good information on the different sites to use. I (so far) have found the best prices going directly to the airline website. For some reason (maybe my location) Kayak was higher than other places I tried. I booked an international ticket through the cheapoair website. It has been a debacle that has cost me more than A$750 Australian dollars. Firstly the email that arrived said the ticket cost US$1800 instead of what I saw when I booked online which was $1600. Because the website asked me my country, I assumed the quote was in my country’s currency. It wasn’t. It was in US$. This means instead of paying $1600 Australian dollars, I ended up paying A$2350, or $750 more than I thought I was paying!! If this wasn’t bad enough, the airline i booked on gives a full refund if cancelled within four hours. Cheapoair refused to cancel 20 minutes afer I booked and phoned them. But told me to forward a screenshot showing $1600 to the billing department. I rang billing the next day and the next. On the third day after booking I asked to speak with a supervisor. They told me the most refund they could give me would be $20!!!! CHEAPOAIR! COST ME 50% MORE THAN ANY OTHER WEBSITE I SEARCHED INCLUDING SKYSCANNER, EDREAMS AND ETIHAD AIRLINES. I WILL NEVER USE THEM AGAIN AND I WILL POST REVIEWS ON EVERY WEBSITE I CAN FIND ADVISING PEOPLE OF THIS FRAUDULENT WEBSITE. Right, when it comes to more complex routes, there is nothing better than an experienced human travel agent. The knowledge and expertise they have, all the little tricks they know, can not be delivered by any software. Been there, done that. Travel agents know how to squeeze the airfares in your favour and how to best to combine flights and itineraries to achieve the best price. The same counts for hotels search, by the way, though to a less extend. It adds an extra destination to every flight usualy for the same or lower price as regular flight. You’ll find the optimal stopovers that could save you money and definitely allow you to discover more of the world! Good ideas ! I am thankful for the information ! Does anyone know where my business could locate a fillable SSA-545-BK form to type on ? WHATEVER YOU DO DON’T USE CHEAPOAIR!! I booked an international ticket through the cheapoair website. It has been a debacle that has cost me more than 4700 Australian dollars. This page, and the comments field is a great source of information, thanks a lot Natasha! I’d like to mention my engine at panflights.com, which is getting some traction. I think it is among the most flexible flight search engine out there. Instead of entering cites to visit like you normally do, you can specify states, countries, groups of countries or subcontinents. You can search including airports within a distance of up to 1000 km away. You can specify wide date ranges, not just a single date or +/- 3 days which is more common. When you visit several places, it can optimize the visiting order of those places, to give you a price and routing that would otherwise be hard to find. There is a system to help you split up your trips by adding stopovers at natural locations. This can not only add adventure, but also make your trips cheaper, since the individual legs can be taken on days when there are lots of unsold seats, meaning prices are lower. Which of the listed search engines includes baggage fees? Without that information they are all pretty much not valuable to me. If your date is flexible, homecityflights.com could be another option, select a departure city(home city), it will show all the cheap destination flights ordered by prices across all continents.